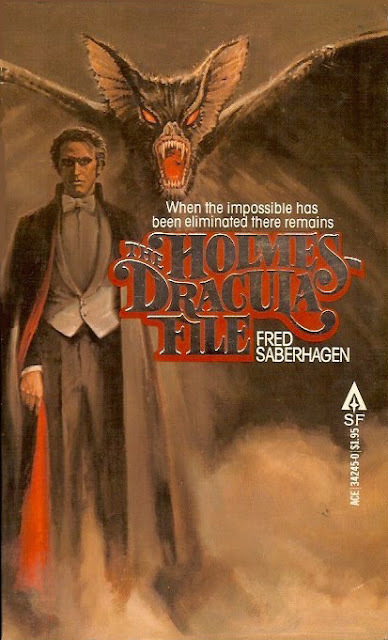 For Halloween, here's a look back at Fred Saberhagen's The Holmes-Dracula File, the second book in his ten-book Dracula series. This is the first U.S. paperback edition. From the writing of the late John H. Watson, M.D. It is with emotions doubly strange that I at last take up my pen to write the story involving the creature I have elsewhere referred to as the Giant Rat of Sumatra–a story, I may add that until quite recently I had thought likely would remain forever unrecorded . . . surely the most bizarre case in all the long and illustrious career of my friend Sherlock Holmes. By Holmes' own instructions, it must go with some few private papers of his own, into the deepest vaults of the Oxford Street bank. There it is to remain for years or decades, for centuries if need be, until a mist singular password shall be presented for its removal . . . .